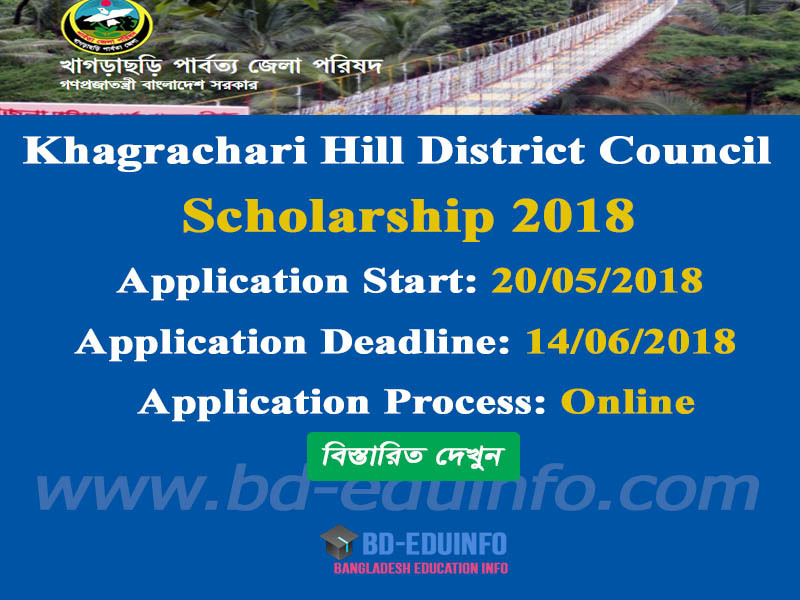 Every year Khagrachari Hill District Council scholarships to the meritorious students in need of financial aid studying at different levels of education since its beginning. Every Interested Chittagong Hill Tracts Permanent Residence students can apply from 20 May, 2018 and within 14 June, 2018.
a. Please prepare a color Photograph (Dimension 300x300 pixel JPG format) and Signature (Dimension 300x80 pixel JPG format). c. You Should fill up all information correctly. d. Upload your photo and signature. g. Download your copy and print your Application copy for future reference. 1. GPA / CGPA / equivalent results are not required to apply to the students found at below 3.00 points on the 5th scale of 3.5 and 4 scale. Khagrachari Hill District Council authority will be published Result their Official website notice board http://khdc.gov.bd/. 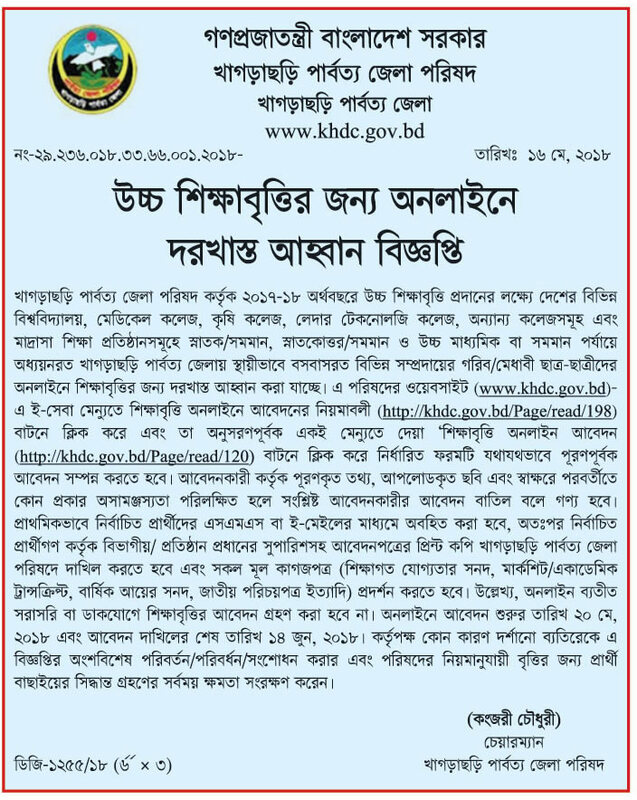 Tags: Khagrachari Hill District Council Online Application form, www.khdc.gov.bd, www khdc gov bd, scholar, national scholarship, scholarships, free scholarships, scholarship search, scholarship finder, scholarships for students, undergraduate scholarships, scholarships for graduate students, list of scholarships, merit scholarships, available scholarships, scholarship application form, how to apply for scholarships, find scholarships, online scholarship application, graduate scholarships, postgraduate scholarships, private scholarships, education bd, need based scholarships, education result, scholarship information, education scholarships, scholarships for college students, scholarship offers, general scholarships, free scholarship applications, scholarship requirements, apply for free scholarships, study scholarships, scholarships for high school seniors, college scholarships for women, schoolscholarship, higher education scholarship, scholarship positions, scholarship result, ssc education, all result bd, scholarship application letter, Chittagong Hill Tracts Development Board scholarship 2017-2018, Khagrachari Hill District Council scholarship 2017-2018 primary selected list, Khagrachari Hill District Council scholarship result 2017-2018. 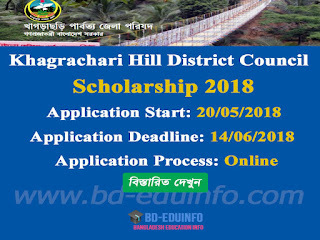 Khagrachari Hill District Council Online Application form, www.khdc.gov.bd, www khdc gov bd, scholar, national scholarship, scholarships, free scholarships, scholarship search, scholarship finder, scholarships for students, undergraduate scholarships, scholarships for graduate students, list of scholarships, merit scholarships, available scholarships, scholarship application form, how to apply for scholarships, find scholarships, online scholarship application, graduate scholarships, postgraduate scholarships, private scholarships, education bd, need based scholarships, education result, scholarship information, education scholarships, scholarships for college students, scholarship offers, general scholarships, free scholarship applications, scholarship requirements, apply for free scholarships, study scholarships, scholarships for high school seniors, college scholarships for women, schoolscholarship, higher education scholarship, scholarship positions, scholarship result, ssc education, all result bd, scholarship application letter, Chittagong Hill Tracts Development Board scholarship 2017-2018, Khagrachari Hill District Council scholarship 2017-2018 primary selected list, Khagrachari Hill District Council scholarship result 2017-2018.